The Heller 75cm Tower Fan with Remote allows you to enjoy a refreshing breeze without cluttering your home. 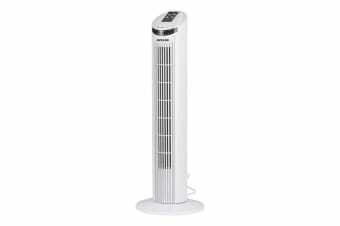 Great alternative to bulky coolers, the slim and and sleek design of the Heller 75cm Tower Fan delivers a refreshing breeze throughout your indoor spaces with 90 degree oscillation. Don’t break another sweat with the tower fan’s 7.5hr timer and remote control operations giving you the ultimate convenience. Set your fan on normal for a classic cool wind, nature mode for that authentic natural breeze or sleep mode for a cool night’s rest. The added concealed handle on the back of the tower fan also makes it easy to carry between rooms!